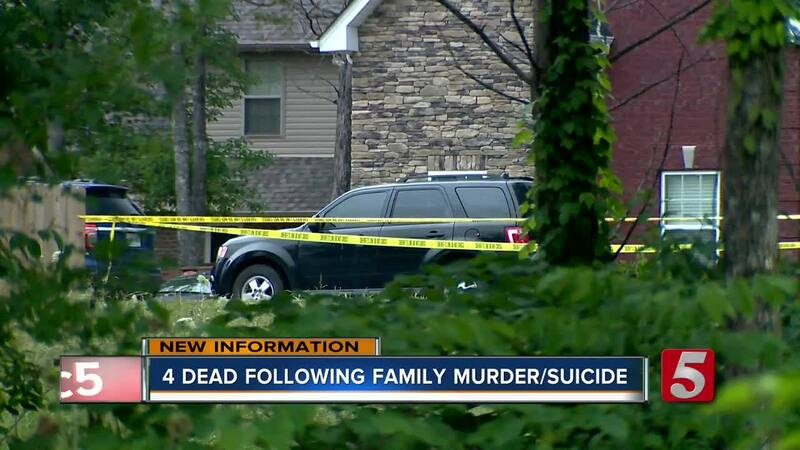 Four people were found shot and killed in a murder-suicide at a Murfreesboro home. The incident happened in a home on the 1100 block of Rivercrest Drive in the Walter Hill community. According to officials with the Rutherford County Sheriff's Office, police responded to a call of shots fired around 3:30 p.m. Monday. The Rutherford County Sheriff's Office said Sean Ganey shot and killed his wife, Cassidy Ganey ; his father-in-law, Kenny Adair; and Cassidy’s stepmother, Shelly Lorenz-Adair. He then turned the gun on himself. Officers found their bodies inside the bedroom of the home. The gun used in the shooting was also found in the home. Sheriff's deputies were called to the home last week to respond to Ganey, who was experiencing suicidal thoughts. They took him to an area hospital to be evaluated. They're working to find out what happened from that point until Monday. At the time of last week's contact with deputies, the sheriff's office and Ganey's family believed they had removed all the weapons from the home. This was the second murder-suicide in Murfreesboro in a matter of two weeks. If you or someone you know is in a domestic violence situation, there is help out there. The National Domestic Violence Hotline is confidential and can help you find resources. The toll-free hotline is 1-800-799-7233. There are also resources in several local counties. The DVP Shelter in Murfreesboro can be contacted by clicking here . Davidson County also has resources on its website . A gofundme account was created for Cassidy's young daughter.